Which is what the plaque at the base of this statue says. 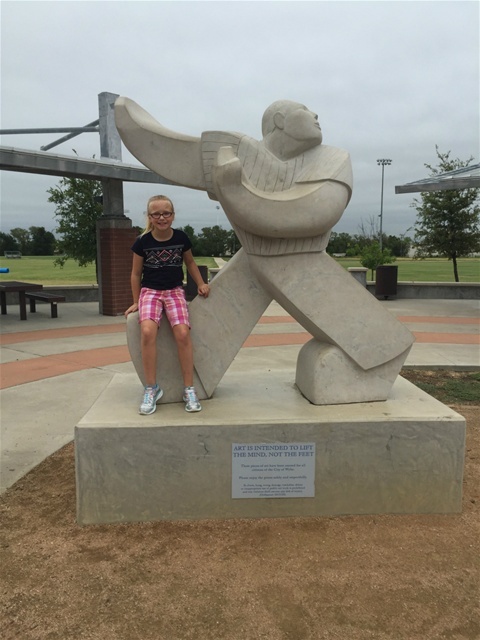 It also says these pieces of art have been created for all the citizens of the City of Wylie and we are to enjoy them safely and respectfully, which means don’t deface them or climb on them. These statues – there are two of them – are part of the environment at Pirate’s Cove Playground in Wylie, Texas and that is our granddaughter, Jessie, enjoying her statue safely and respectfully. Notice, her feet are on the ground. School doesn’t start for Jessie and her sister, Emily, until next Monday, August 24th. If questioned, their mommy could tell us exactly how many hours, minutes and seconds are left till they head off to second grade and kindergarten. Facebook has been filled this week with pictures of small and large children heading off into the future. Pictures of these two will be up before 8 a.m. next Monday. I think what we hope when we send our precious children off to school is that their teacher will love them, accept them as they are and see the hidden treasure buried inside each one of them. It would be nice if this teacher could awaken a love of reading in them that will carry them through their lives; teach them that spelling and grammar are necessary, not just a useless frill; help them to appreciate math and science; be kind to others, use nice words only and aspire to be on Jeopardy! one day. Yes, I still have them...all ten volumes! I suspect that God hopes the same things for us as we hope for our children as we enter the world. He wants the best for us. He wants us to be our best. To live our best life. Jesus liked children. There are so many pictures depicting Jesus with little people. I suspect He knew all the best knock-knock jokes of the day, and He probably told each child he got close to that God loved him and had a plan for his life for good.